The Markha Valley trek is one of the most popular treks in India. 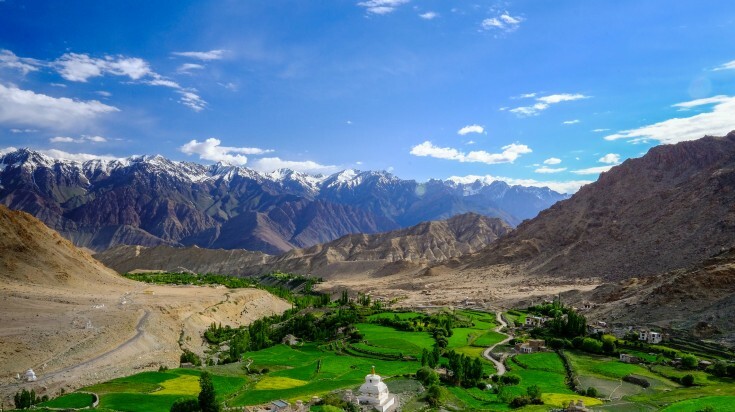 Located in the northwestern Ladakh region, this area boasts breathtaking views, colorful villages, towering mountain ranges, and lush and diverse landscapes. It’s no wonder that hundreds of adventurous and intrepid travelers flock to this region each year to take on this challenging route. The trail follows a stunning high valley, running parallel to the Himalayan mountain range. Travelers will traverse through rocky mountain passes, through knee-deep rivers, and cross verdant flatlands and farmlands. By no means an easy route, the Markha Valley trek thoroughly rewards all who walk its trails. 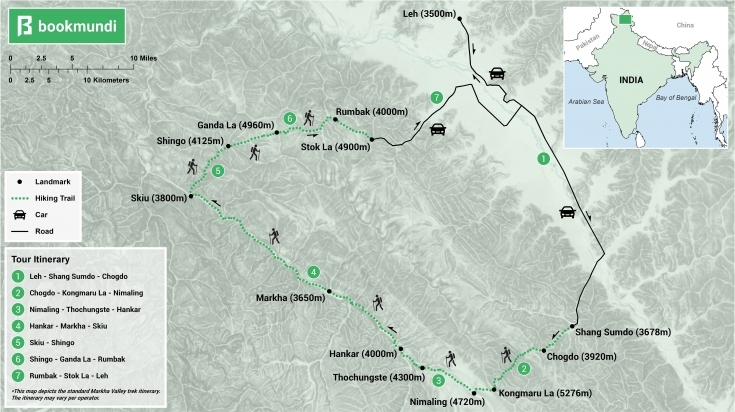 Start/end locations: Trekkers begin their journey in Leh. From there, you will be transported via Jeep to Marteseland and the entrance to Hemis National Park. The end point is the village of Stok, where trekkers often spend one night before returning by car or bus to Leh. It is also possible to complete this hike in the opposite direction, starting in Stok and ending in Leh. Difficulty: Difficult. This trek requires a good level of fitness and stamina. There are several steep ascents, waist-deep river crossings, high rocky canyons and you will have to trek over slippery scree. Trek duration: 4 – 9 days. The total distance of this trek is between 50 and 96 kilometers, depending on where you choose to start from. The itinerary below covers a distance of approximately 75 kilometers. Remoteness: Remote. This trek winds through mountains, valleys and a number of small villages. The trails are well-marked and easy to follow. Although you won’t find many stores along the way, there are a few places to stock up on supplies. 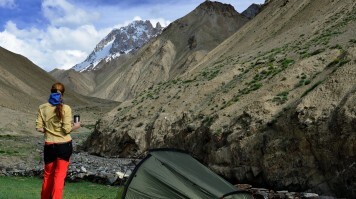 There are also parachute campgrounds and homestays where trekkers can enjoy a hot meal and a good night’s rest. Accommodation type: Camping and homestays. There are few options for accommodations along this remote trekking route. One of the easiest things to do is camp. You can either choose to bring your own gear or make use of the campsites built by locals exclusively for trekkers along the route. For USD 8*, you can enjoy a comfortable night’s stay in a tent with a thick mattress, blankets and meals. Alternatively, homestay options are also available in each town. For less than USD 10*, you can stay in a basic but comfortable room in the home of a very welcoming family. Homestay cost typically includes 3 meals and water. 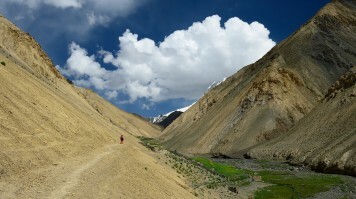 Best season: Summer (June to September) is typically considered the best season for a Markha Valley trek. At this time of year, the paths are clear of snow, the weather is mild, and the sun is shining. Temperatures range between 20° and 30° C in the day. Treks in the Markha Valley can range between 4 and 9 days depending on your fitness level, enthusiasm, and time limits. The average duration spent on the trail is seven days and six nights. Below is an example of a standard seven-day itinerary for the Markha Valley trek. 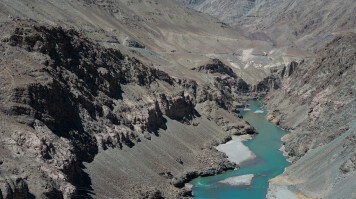 Day 1: Drive from Leh to Shang where you will start your trek. Hike through the wilderness to the small village of Chogdo. Spend the night either at a campsite or a homestay. Day 2: Depart Chogdo and start your ascent through the first mountain pass, Kongmaru La. 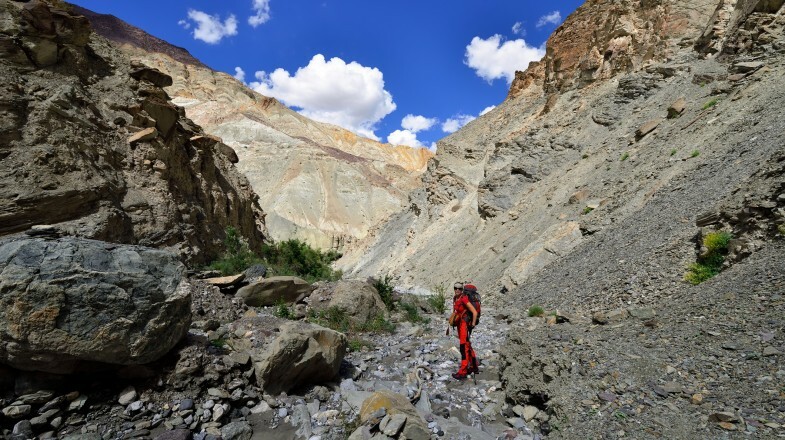 Be prepared, this part of the trek is rather steep; however, the incredible views of Kangyatse, Zanskar and the Karakoram ranges make the effort worth it. After enjoying a rest and the view, descend down the trail towards the lush green pastures of Nimaling. Spend the night at a campground. At six to seven hours on the trail, this is one of the longest days of the trek. Day 3: Wake up in picturesque Nimaling and start your descent to the village of Hankar. You’ll pass through beautiful green pastures, cross picturesque mountain lakes, and see verdant farmlands of Thochungste before arriving in the village. Set up camp for the night here. Day 4: Depart Hankar in the direction of Skiu via Markha. This section of the hike will have you crossing through several deep rivers — make sure you have extra boots (or waterproof boots)! Markha is one of the largest villages on this trek, although it’s only home to approximately 20 families. It is incredibly charming and very beautiful and is a great place to stop, rest and enjoy lunch with a view. Back on the trail, continue your descent passing through the small provinces of Nakdi, Sarah and Hamburjah, and Pentre, before arriving at the campsite in Skiu. 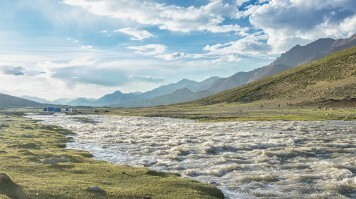 Day 5: Head in the direction of the Zanskar River and follow it upstream to the village of Skiu. At this point, turn away from the main river and go through the incredible gorge toward Shingo. Camp overnight. Day 6: Prepare for a long day as you trek from Shingo to Rumbak. Start with a gradual climb as you ascend the Gandala Pass. Continue through Yurutse and make your way down to the campsite near Rumbak. Get a good night’s rest because day 7 is a big one! Day 7: Start your ascent to the base of Stok La at 4,900 meters. At this point, the trail becomes quite steep as you climb higher towards the pass. Continue along the trail stopping to take in the amazing views of the Indus Valley and colorful Stok La as you go. After triumphantly crossing the pass, it’s time to make your descent. Follow the trail along the mountainside until you arrive in the small village of Stok, ending your hike. From Stok, transfer by car or bus back to your hotel for a night of relaxation and recovery. It is possible to complete the Markha Valley Trek in four to five days. See below for a short alternative itinerary. Day 1: From Leh, transfer via car or taxi to Chilling. Depart and climb approximately five kilometers until you reach the Markha Valley. From here, walk along the flat land, passing several villages, before arriving in Sara. Here, camp for the night. Day 2: Depart from Sara and hike for eight kilometers on relatively flat land. Enjoy stunning mountain views, lush fields, and colorful and charming villages. Spend the night in Markha, either at the campsite or in one of the local homes. Day 3: Wake up in Markha and depart in the direction of Hankar. Mid-day, you’ll be rewarded with great views of Kangyatze peak. Continue on through the valley until you reach Hankar. The halfway point of the day’s hike, this is a great pitstop for a rest or lunch. From Hankar, the trail becomes increasingly difficult. Ascend 500 meters over just a few kilometers to reach Thochugste. You’ll camp here for the night, setting up your tent alongside a mighty river. Day 4 – 5: Depending on your fitness level and fervor, this section can be completed as one or split in two. Start the day by ascending 500 meters to arrive in Nimaling. You’ll pass by herds of yaks and Himalayan horses. You can either spend the night here or press on. If you choose to spend the night, Nimaling has both a campsite and homestay options for trekkers. Depart Nimaling for the Gongmaru La pass. At 5,200 meters, Gongmaru Pass is the highest point in the hike. The ascent is hard, but the views along the way are spectacular. After the pass, start your descent. This portion of the trail is steep. You’ll descend 1,500 meters in approximately four hours! Follow the river that flows through the valley. After a few hours you’ll find yourself in Shang Sumdo, the end point of the trek. Travel back to Leh by car or bus and enjoy a restful and relaxing evening. The easiest way to get to any of the start locations from Leh is to hire a taxi. The journey takes around 1 hour and 20 minutes and should cost approximately USD 40*. Book accommodations in advance! Homestays can fill up incredibly fast. To avoid disappointment and having to search for a bed at the end of a long day, book your accommodations well in advance of your trek. Homestays can be booked through the website of Himalayan Homestays. Altitude sickness is a common ailment for hikers in the Marka Valley. To avoid getting sick, spend a day or two in Leh to acclimatize before your trek. On the route, it’s important to take things slow and drink plenty of water. Dress appropriately! Temperatures and conditions vary throughout the trek, so opt for comfortable clothing and sturdy gear. It’s also a good idea to bring an extra pair of boots with you as there are a few deep river crossings. Although the trails are well-marked, it’s not safe to do this trek solo. Make sure you have a hiking buddy or a knowledgeable guide with whom to complete your journey. Detailed maps of the Markha Valley and surrounding area can be picked up in Leh before you start your journey. Keep your camera handy. The views and vistas are amazing, you won’t want to miss the chance to capture these once-in-a-lifetime pics. The Markha Valley trek is popular with intrepid travelers from around the world. And it’s not hard to see why it ranks at the top of many adventurous and ambitious travelers’ bucket lists. With its incredible views, lush landscapes, and untouched natural surroundings, the Markha Valley trek is an unforgettable and unparalleled experience for all who hike its trails.